This morning started out a little rough. For several hours I dozed and snoozed, trying to squeeze in every second of extra sleep I could get. Days have gotten much longer now that summer is approaching, which means the early sunrise makes my apartment too bright and too hot to solidly sleep past 6 o’clock. Somehow I pulled myself out of bed, showered, shaved, dressed, and ate breakfast in record time. I even got to school a few minutes early for once. Wednesdays are my longest days. I teach six periods, and immediately after my last class it’s time for staff volleyball. Let’s just say I wasn’t exactly looking forward to today. But, my attitude changed the moment I got to my office. A red carnation and handmade note from a student was waiting for me at my desk. What a nice surprise! Today was Teachers’ Day in Korea. Annie, one of my best English students has always given me little gifts and snacks for certain holidays. She’s the kind of student I know will be very successful in life. There’s something different about her. Something special. And she’s always made me feel loved and appreciated. The day just kept getting better after that. My classes went particularly well. I received various cards, letters, and notes from students. Some were written in English. Others were a combination of English and Korean. One was scribbled in Korean only. Each was so cute, and I’ll cherish them forever. I was in for another surprise toward the end of the day. Several of my former students returned to Bibong Elementary to see their previous teachers. A few from my first group of sixth grade students, now in eighth grade, even decorated a balloon for me. It was so fun to catch up. They’ve grown a lot. I made it just in time for the second round of staff volleyball this week. For some reason we played yesterday and today. I’m glad we did. I’ve continually improved, and other teachers, as well as my principal and vice principal, have noticed. They’ve taught me a lot, and have pushed me to get better. Staff volleyball went from being one of my least favorite things in Korea to one of the highlights. It’s truly the only time and opportunity for me to bond with other teachers at my school, and feel like I’m part of the team. Playing a sport together doesn’t require a lot of spoken communication. We let cooperation and team spirit do the talking. Since it was a special day to recognize teachers, we feasted on fried chicken, and various Korean dishes after volleyball. And right when I got home, I received a text message from Julia, one of my favorite sixth grade students from last year. Julia is like Annie. She’s gone above and beyond, and has always stood out to me. I hope to never lose track of her. I’m so grateful for everything and everyone in my life at the moment. Even though the day started out a bit rough, it ended up being one of the best I’ve had in a long time. I even got a letter from a student I thought hated me. In it he confessed he used to be scared of me, but now he thinks I’m the kindest teacher. I need to give him bonus points for using English terms we learned in class. I’m a very happy, proud, and thankful teacher as I get ready to call it a night. 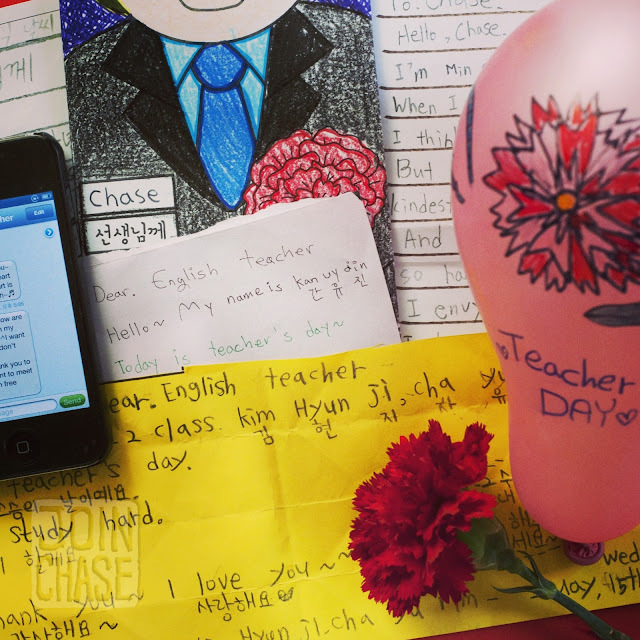 I hope my fellow Guest English Teachers in South Korea had a wonderful Teachers' Day too.